Introduced here is a new version of the Prominence Bromate Analysis System using the ion chromatography—post-column absorbance detection method, which is based on the water quality inspection method. In addition to Shimadzu's well-established reaction reagent mixing device (Japanese Patent No. 4082309), the system uses the LC-20Ai, which offers improved solvent delivery stability. In addition, it features the SIL-20AC autosampler that offers high injection accuracy to enable high-sensitivity analysis of bromate on the order of ng/L (ppt). Incorporating the LC-20Ai solvent delivery pump for inert LC reduces baseline noise. The LC-20Ai features an improved solvent delivery control mechanism as the reaction reagent delivery pump of the bromate analysis system. This enables even higher-sensitivity bromate analysis. The SIL-20AC autosampler features a pump measuring method and a total volume injection method for significantly improved injection accuracy. It also has an inert tubing kit in order to reduce the absorption and decomposition of bromate caused by contact with metallic parts. The lower chromatogram shows the analysis of commercially available bread. 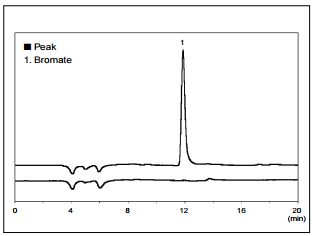 The upper chromatogram shows the analysis of the same bread, in which potassium bromate was spiked to make a content of 326µg of potassium bromate (equivalent to 250µg bromate ion) per 10g of bread sample just prior to pretreatment. The peak of bromate ion was not detected in the un-spiked bread sample. For the spiked sample, 325.4µg of potassium bromate (equivalent to 249.4µg bromate ion) per 10g of bread was determined, indicating nearly complete recovery of the spiked quantity.